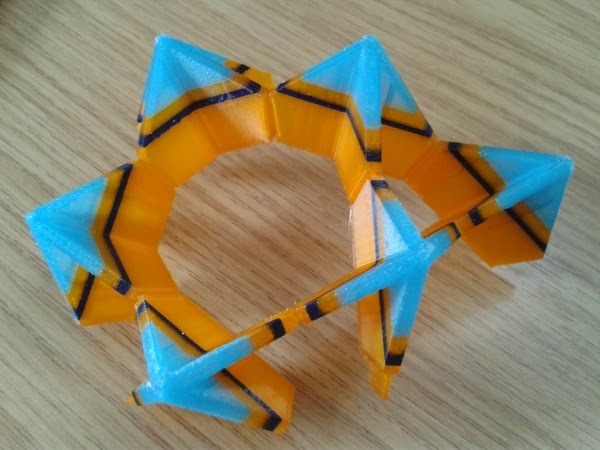 Today's post is contributed by Austin Day, aka AuntDaisy on Thingiverse, from Aunt Daisy Scientific Ltd., UK. AuntDaisy is the designer of the Trilobite articulatum model that we printed on Day 130 as well as the beautiful 3D-printable modular origami Electra model that we printed on Day 323. Thank you Austin/AuntDaisy for guest posting today! Why 3D print an origami model? Like most families, we love to decorate our Christmas tree and have spent many happy hours making origami stars, angels and woven Danish Hearts. My favourite star has to be David Mitchell’s beautiful Electra - it’s an incredibly symmetrical model, and, unlike some modular origami models, is surprisingly robust. But, when you have children, you soon find that things get squashed or shot at with Nerf bullets :-) While straightening out Electra for the umpteenth time, I thought – why not 3D print this? 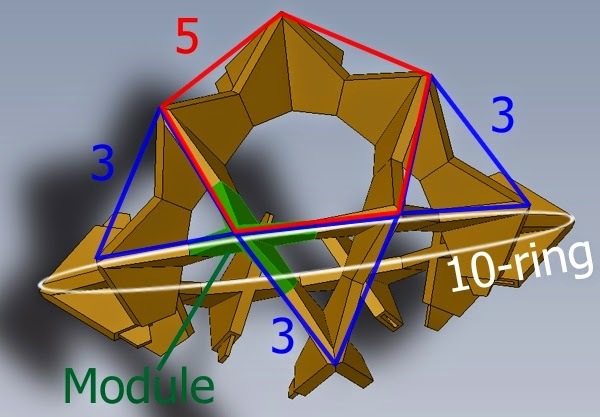 Most people think of origami models as being folded from a single sheet of paper (for example, Robert J Lang’s creations), but modular origami joins lots of small, folded modules together to make a larger model that is often mathematical in style. Kunihiko Kasahara’s Origami Omnibus and David Mitchell’s Mathematical Origami are good introductions to Maths & origami. If you want to be more adventurous, then I recommend David Mitchell’s Paper Crystals, now in its second edition - “Electra” has appeared in both. Electra - what is an Icosidodecahedron? Electra is a skeletal polyhedral model based on the 60 edges of an icosidodecahedron – a mixture of a dodecahedron (with 12 pentagonal faces) and an icosahedron (20 triangular faces). When assembled, rings of modules dance around each other – five membered rings (pentagons) alternate with three (triangles), but never meet - except at discrete corners (and, even then, under supervision). There are also rings of ten modules forming great circles (like the equator) that run around the whole polyhedron. As you turn Electra in your hands, mirror, 2-fold, 3-fold, 5-fold and even partial 10-fold symmetry magically appears – it’s not surprising that some quasicrystals, with their forbidden 5-fold symmetry, have atoms positioned around an icosidodecahedron. How was the 3D model designed? I started with the X-shaped paper modules and soon found that the top point was a right angle, the tops of the tabs & pockets were at 45 degrees to the base, and the angle between the arms of the X was roughly 60 degrees. Also, ten of the modules made a ring, so the angle between the tilted ends of the pockets (for the tabs) must be 36 degrees (=360/10). The next step was to draw it on paper and calculate the angles & lengths properly. This is where my (spherical) geometry came unstuck! Why wasn’t the X angle exactly 60 degrees? It looked to be 60 degrees, three of the modules met to make a triangle - it must be 60 degrees… It wasn’t - that little tilt between the modules made the maths “messy”. The final step was to put little catches on the tabs so they locked in to a pocket on the opposite side of the module. These proved to be tricky to print, very fragile, and left horrible lumps and bumps on the outside of the module. So I experimented with smooth tabs – they worked much better. A bit more tweaking of the overall module thickness, the tab thickness (40% of this) and the pocket width (1/3) and we’re ready to print and assemble a whole model. There are lots of ways of colouring Electra – David Mitchell recommends chaotic / random colouring or 5 contrasting colours. If you go for 5 colours, then the 6 modules of a particular colour form the corners of an octahedron – a beautiful, hidden symmetry that might have tickled Dürer or Escher, it certainly surprised me. For the assembly, there’s a simple rule – make a ring of 5 modules, then add modules to make rings of three around them, then 5-rings around the 3’s and so on... For the 5 colour version, you also have to make sure that the colour on the corner of a 5-ring matches that on the opposite corner of a 3-ring. And the resulting 3-color Stripey Electra! Thanks to David Mitchell, Electra now comes in two flavours – the 30 module vanilla shown here; and twice as much fun “Electra 60” - based around a rhombicosidodecahedron with triangles, squares and pentagons. This is where paper beats plastic – paper will happily cope with changes in the module angles… but I can’t! A big thank-you to Laura Taalman for her fascinating blog and inspirational models – and for inviting me to be a guest blogger. Also to David Mitchell for his beautiful models and origami books.